As a homeowner, you’re sure to have some repairs or fixes to make over time. Although it might seem daunting, investing in a tool set can make your life a little easier. You’ll have all sorts of tools at your disposal, perfect for any home project or repair. Tool sets come with a wide array of options. That being said, we’re here to help you navigate the ins and outs of purchasing a tool set! We’ve done the shopping for you – all you need to do now is choose your new tool set! 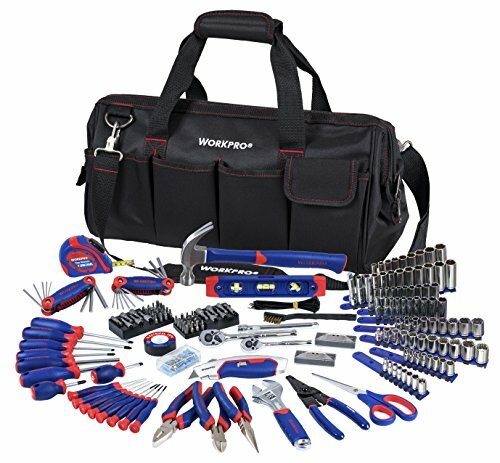 WORKPRO, a household name in hand tools, enters a strong contender in this list with their 322-piece tool set. The chrome vanadium steel tools are sure to withstand almost any project you can think of. The durability and value of this set cannot be overstated. This 322-piece tool set contains all of the tools you’ll ever need to tackle home repairs and projects. The manufacturer constructed the tools out of vanadium steel for enhanced strength, durability, and torque. They also feature a chrome polish for anti-corrosion protection against wear and tear. Your tools will remain looking as good as new after a day’s use! Rubberized grips on several tools ensure a solid, comfortable grip as you use them. Other handles feature fiberglass or comfort grips to make working not only a chore but a joy! The tool set comes with sockets, pliers, screwdrivers, a spirit level, a hammer, a utility knife, a tape measure, a hex key, and an adjustable wrench. This tool set also comes with a multi-purpose tool bag in which to store your tools. We love this tool set for the sheer variety of tools it comes with. Also, their solid construction of vanadium steel makes them a durable, valuable addition to your home improvement workspace. The anti-corrosion finish helps the tools last a long time and wear very well. This tool set is the most comprehensive of those included in this list. 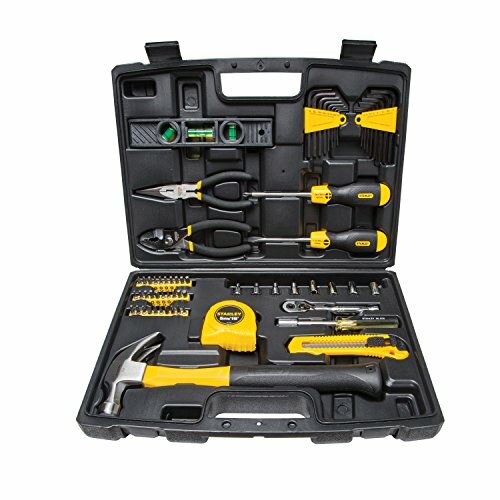 For those looking for a little of everything, you’ll want to consider purchasing this tool set. The tool bag appears to limit the organization of the tools, however. Some people recommend separating some of the tools in bags, so they don’t get lost in the included multi-purpose bag. This tool set also does not include box wrenches. If you’re searching for these, you’ll need to purchase them separately. Black+Decker is one of the most well-respected names in terms of tools. This drill and home tool kit will help you tackle all sorts of projects around your house. The lithium ion drill is an added bonus to this kit over others in this list. 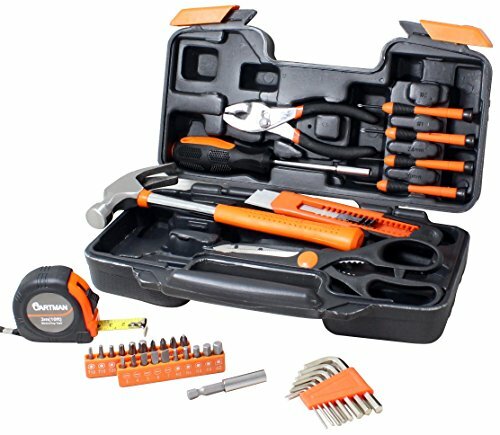 The Black+Decker 68-piece kit includes almost anything you could need for small home projects and repairs. Made with high-quality materials, the tools combine the best of durability and comfort to ensure your work is enjoyable as well as practical. The drill is the highlight of this kit. The 20V drill runs on a lithium-ion battery which holds a charge up to 18 months. The packaging includes the drill, a battery pack, drill bits, and hand tools such as a hammer, pliers, screwdrivers, and a wrench. Also included is a carrying bag. Where this tool set really shines is its included drill. Although perhaps not the most high-end drill, it will nonetheless perform admirably. The long battery life ensures you can use this drill for quite a long time. Black+Decker create high-quality tools as well so you can be sure that you’re getting a great deal for the cost of this tool set. Most homeowners will find this tool set sufficient. But if you’re looking for higher quality tools, you might consider spending more money on a separate tool set with high-grade tools. The tools included are effective for small projects, but if you’re looking to tackle more industrial jobs, make sure to look for something else. Overall, this is a great tool set for anyone who is looking for value! This Cartman 39-piece tool set offers some best-in-class tools for small home projects. Budget-conscious homeowners will love the combined value, durability, and sturdiness of this tool set. The attractive orange external appearance underlies the sturdy construction of these tools. The Cartman 39-piece tool set features all of the tools needed for minor home repairs, general purpose projects, or home maintenance. Made of high-strength and quality materials, the tools are also heat-treated for enhanced durability and chrome-plated to withstand corrosion. A case holds all of the tools in molded storage so you can easily transport it to and fro. The tool set includes a tape measure, a claw hammer, joint pliers, a bit driver, a bit connector, scissors, a utility snap-off knife, four screwdrivers, eight hex keys, and twenty screwdriver bits. If you’re looking for an inexpensive tool set that still offers quality and enough tools to allow you to do repairs, look no further than the Cartman 39-piece tool set. The corrosion-resistant and heat-treated durability make this a sturdy, solid basic option for homeowners, whether you are a DIYer or not. Overall, this is a great basic tool set for just about everyone. Stanley is a household name in tools, one that has been around for decades. It should come as no surprise that this 65-piece offers excellent value to any homeowner. These tools meet or exceed ANSI standards and are your answer for almost any home project. The Stanley 65-piece tool set contains almost all of the tools you could need for small projects around your house including ratchets, a hammer, and sockets. The ratchets feature an ergonomic design to make even the most taxing work more comfortable and less strain on your hand. They also have a thumb-operated, reverse-switch mechanism that’s quite easy to use. The sockets feature something known as Max-Drive design. This design adds more torque than normal sockets and making turning rounded corners easier. This kit also features a blow-molded case for storage. This tool kit includes a tape rule, hammer, snap off knife, torpedo level, long nose pliers, slip joint pliers, screwdrivers, and mechanics tools. The Stanley 65-piece tool kit is a great intermediate tool set for any homeowner. It contains many of the most common tools for use in many projects. The ergonomic design of the ratchets will make holding them more comfortable, and the socket design makes them more powerful for turning. The tools are crafted from high-quality steel, so you’re sure to rely on Stanley for durability and quality. On the whole, this is a reliable and useful tool set that should last you for years. Cartman offers another excellent tool set, this time with 148-pieces. Securely housed in a blow molded plastic toolbox, you won’t go wrong with this set if you’re searching for one suited for both home and garage repairs! Cartman has heat-treated and chrome-plated this tool set for enhanced durability and corrosion protection respectively. 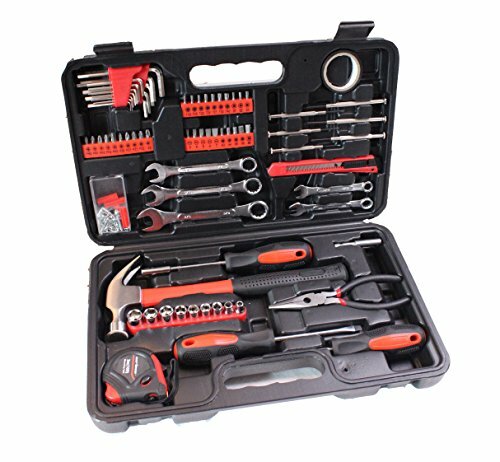 This 148-piece tool set is more comprehensive than others in this list while still being a great value. The hard shell case not only organizes the tools, but it keeps them safe against the elements or any light impact. The easy portability ensures you’re able to carry it to any location. The packaging contains hex keys, screwdrivers, screwdriving handles, combination wrench, magnetic holder, screwdriver bits, cutter, measuring tape, cable ties, claw hammer, pliers, sockets, and insulated tape. The steel in these tools is relatively high-grade and should withstand regular use. It might not be high-end, but Cartman is known for crafting quality tools for almost any homeowner. This tool set doesn’t pretend to cover every situation, but it’s a perfect, budget option for a homeowner who desires a tool set that can take care of the basics like fixing a leaky faucet, hanging pictures or shelving, securing a chicken wire to a post, or other small projects! What Is the Best Tool Set for Homeowners? 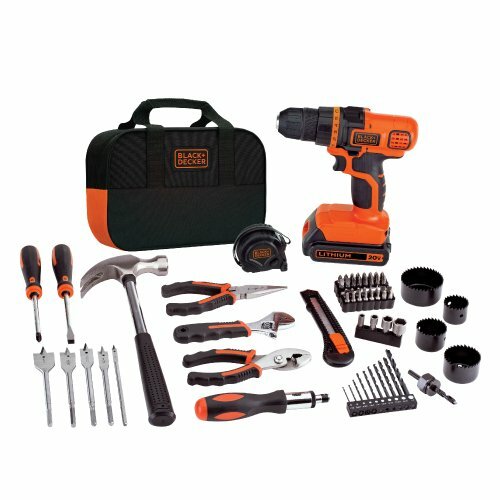 Although all of these tool sets offer their own benefits, we particularly love the BLACK+DECKER 20V MAX Drill & Home Tool Kit, 68 Piece (LDX120PK). Not only does it provide some of the most basic home tools, but the added bonus of the drill also makes it a great value compared to others kits in this list. This home kit is only budget-friendly, it’s also made by one of the most well-known tool companies in America. What Should Be in a Basic Home Tool Kit? Not all tools are created equal. It’s tempting to want to save money by purchasing a cheap, knock-off brand of a tool set. We recommend, however, purchasing from a brand known for their quality. Black+Decker, Stanley, Cartman, and WorkPro are all manufacturers that have gained a good name for creating reliable, solid tools. As we’ve shown above, not all tool sets contain the same tools. Some might not contain tools such as ratchets, sockets, a drill, or pliers. That’s why it’s important to identify which tools you need the most and find a tool set that contains all of them. This way, you’re not forced to purchase missing tools separately. How to Use a Moisture Meter? As always, pricing is an important consideration in purchasing a tool set. The budget-conscious homeowner might purchase the cheaper Cartman 39-piece set. Keep in mind, however, that the cheaper the price, the less tools the set will contain and possibly even lower quality. We highly recommend investing a little more money into something of higher quality. Most kits come with a carrying case or a storage container. Portability is key if you’re looking to carry your tools with you around your home. That being said, some common complaints about storage include that they don’t always stay in their containers, especially if the storage contains blow-molded, designated places for your tools. 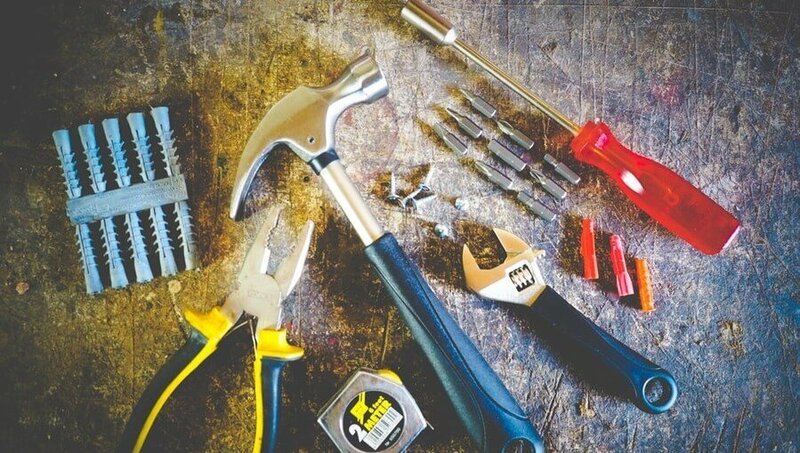 Tool sets include any number of tools such as a hammer, pliers, wrenches, and anything else you can use to complete your projects successfully. Any homeowner should have a tool set. They easily become your best friend when it comes to home repairs or projects. We hope you found this guide useful, and we wish you the best of luck with your search! I hope you found our Best Tool Sets for Homeowners article useful. Do you have any other questions about any other tool set brand?